It’s that time of year when we can finally switch fleece for flip-flops (except in Seattle where the combination is de rigeur for most of the year). 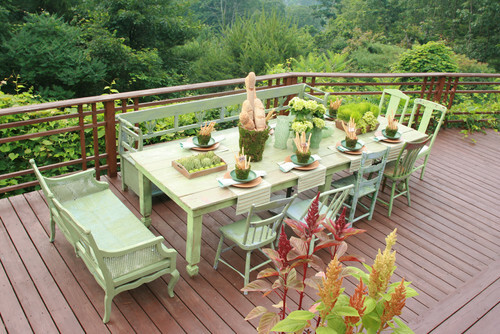 Meals can be enjoyed outside, entertaining is easier and life generally seems more relaxed. But is your patio up to the task? I am often asked for help decorating patios, balconies and decks when I visit clients to discuss container garden design. Small spaces seem to preclude doing anything much at all while large, open patios can be daunting. Where to start? Just as with landscape design, the first question should always be about function. How do you want to use the space? Do you need to create a cozy lunch spot for two or be able to host an elegant candlelight dinner party for ten? Do you plan to sit and enjoy a view or do you need to hide it? Here are some ideas get you thinking. 1. Bring out your personality! This homeowner is just as much fun as her rooftop patio suggests! Don’t be afraid to bring out the party animal in you! The patio above may not be for everyone but it is the perfect representation of the homeowners fun-loving style. Bold color choices, whimsical art and over-sized pots combine to create a zany space which exudes attitude. 2. A cozy space to sit with morning coffee. Not every seating area on the patio has to include a dining table. The photo above shows how a simple entry courtyard takes advantage of a deep step leading to the front door; it’s a perfect spot for a comfy chair or two. The color palette for the container garden designs was taken from the front door and textiles to create a cohesive look to the entire space. Bistro sets take up very little space and many can be folded for storage so offer a great solution for tiny spaces as seen above. 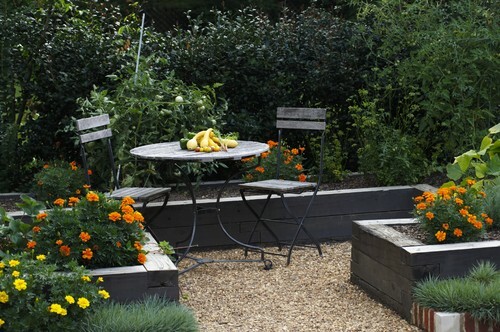 The raised beds give a sense of enclosure, making the little nook seem more intimate. Custom, built-in seating can take advantage of awkward corners, bringing function to an otherwise unusable space. In the Tucson garden shown above a concrete chaise makes a strong design statement with its interesting lines and rich colors. This corner lives large thanks to the use of built in pieces. 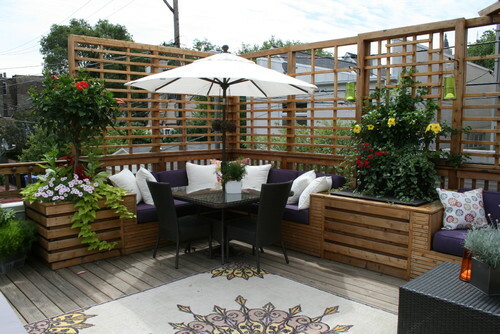 Planter boxes and bench seating create a perfect eating nook while trellising provides a degree of privacy. This garden originally consisted of one long expanse of deck , a section of constantly wet grass and a steep garden with just a couple of trees. By breaking up the garden into separate outdoor rooms, (slight changes in elevation helped define this) and building retaining walls to act as terracing for the garden we were able to create a large deck for dining, a more intimate flagstone patio for evening wine and a fun viewing deck from which to enjoy an elevated view of the garden as well as a partially obscured water feature. Notice also how shades of yellow and chartreuse help connect the spaces, leading the eye throughout the garden, helping it to seem much larger than it really is. The chances are that if you have a dining room at home you have selected some items to personalize it. A table runner perhaps, a favorite vase to be filled with seasonal flowers, art work for the walls and maybe a potted plant or two. Our outdoor dining rooms can be accessorized in exactly the same way. The beautiful patio above uses red to connect the chair cushions to the container gardens. Notice the details in the patio featured above. An eclectic mix of chairs and benches are united by a quick coat of paint. Table decorations and textiles continue the theme while keeping the focus on the stunning view. Fountains, waterfalls, ponds and pools – the sound and sight of water adds another element to our deckscaping. Wall fountains are ideal where there is limited floor space. The elegant patio shown above takes advantage of the park like setting yet includes a fountain as a focal point to bring a more human scale to the space. I’m a very detail oriented person – I can’t help myself! So when I saw the color of these chaise cushions at a clients home I knew exactly which plant I wanted to add to the little container. This tropical looking Anthurrium will be happy in this semi-shaded spot until fall. I have been known to carry photographs and fabric swatches to nurseries before now to get exactly the right shade of million bells or geranium for a client! I’m not suggesting that this is necessary to have a good looking patio, but it may help you at least stay on track to actually think of your overall color scheme when shopping for plants. So grab your flip flops and head outside. Does your patio need a little TLC to be party ready? This is one of the most informative and inspiring posts I have seen this season. The depth and breadth of your examples is most impressive. I’m sure a lot of people will bookmark for future use. Wonderful examples! I think it is fine to carry fabric samples to the nursery; it is something I would do. I chose the color of the potted hibiscus on my patio because it repeated the salmon color in the patio’s stonework. The lady I bought it from apologized for the color and tried to get me to look at some others, but now everyone comments on the flowers’ fabulous color. It just goes so well in its setting! No, sadly, my patio isn’t up to the task. But I won’t go into all the details here (let’s just say two giant Cottonwood trees in the neighborhood are a big part of the problem). It sure is sweet to see spectacular patios and design ideas here, though. Thanks for sharing!